Without its corn mill, the community of Millhouses would never have existed. The mill itself has now deteriorated into disrepair. 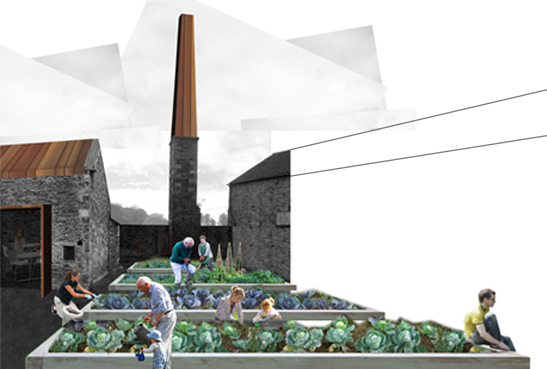 This proposal reinterprets the original function of the corn mill, and sees it reinvented as a predominantly self-sufficient community centre based around the production and provision of food. At the heart of the proposal is a community garden. This is enclosed by a growing wall, through which internal activity can be glimpsed. The garden provides vegetables and herbs for a kitchen, where cooking skills are taught, and which in turn caters for functions in a community hall and a public cafe that opens out into the park. A shop sells produce from the garden and from an on-site bakery. The reinvigoration of the mill buildings will act as a catalyst for the regeneration of Millhouses village centre. This proposal won 3rd place in RIBA Yorkshire Forgotten Spaces Sheffield 2011 ideas competition. See the doma blog for more information.